Cliffs of Moher. Photo by RK. There are lots of B&Bs in Galway. If you happen to visit Galway during one of its festival weeks (there are various), book well in advance. The Corrib Haven lies a 10 minute ride away from the center in Newcastle. It can be booked here. The Kinlay Hostel is right next to Eyre Square. Many tour buses depart in front of it. You can book it here. Dock 1. Seafood bar right at the old dock of Galway serving creamy chowder, cold seafood platters and baked fresh fish. Rouge. French style restaurant, where you get fresh lobster from their little tank and French wines. McSwiggans. This is a maze-like place. You enter in a pub and find the different restaurant levels inside. Their menu is just as big – and not over-priced at all. The Dáil Bar. This bar is located right in the lively pedestrian zone. Here you can eat, drink and listen to live music. Galway is a great location to do tours from. 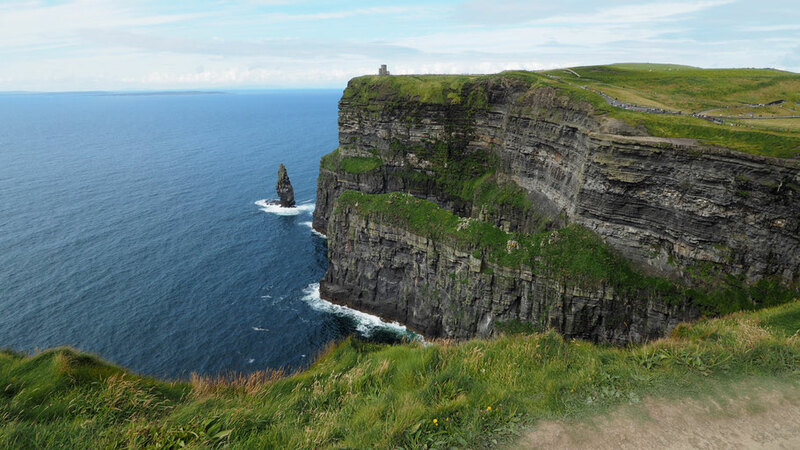 The most popular sight probably are the Cliffs of Moher. It is really nice to drive along the Wild Atlantic Way towards the Cliffs. Do combine a trip to the Cliffs with a visit of the Aran Islands. If the weather is nice, the colors and views on the island will make the wavy ferry trip fully worth it. The smallest of the Aran Islands, Inisheer, is great for biking around. Drive through the karst landscape of the Burren National Park (South West of Galway) and the bog landscape of the Connemara National Park (North West of Galway). Kylemore Abbey. Visit this castle with its fairy-tale-like setting and the Victorian walled gardens. There are various tour operators that take you with buses to the sights above. E.g. Wild Atlantic Way Day Tours are nice and have good prices (you get a discount if you book 2 day tours with them).